MCN Deputy Editor Richard Newland tested this Knox track vest (£159.99) over 14 months, covering 8000 miles. But what did he think of it? What’s good? "I never ride without a back protector, but in recent years the rampant march of product ‘improvement’ has almost unanimously made them all uglier, more ridiculously faux-technical, or less comfortable. Forcefield’s ProSub4, and Knox’s Meta-Sys being standout exceptions for me – both of which I wear regularly. But my favourite go-to right now is this CE Level 2 Knox Track Vest, which has been elevated from being my track- only choice for under a one-piece, to being my daily go-everywhere choice. For use with leathers it’s superb because there are no straps, and it doesn’t move around when you’re getting in and out of your suit. "I’d shunned it for road use not because it was any less suitable, but simply because it was a little too tight to be properly comfortable for long periods. A recent reduction in my stature from Bison to Friesian has meant that’s it’s now spot-on for my 48in chest. It’s exactly the right length, neither fouling the seat on cruisers, tourers and adventure bikes, nor poking me in the back of the neck on superbikes. It never moves, works with all jacket and trouser combos, and the gilet is washable to keep it fresh. 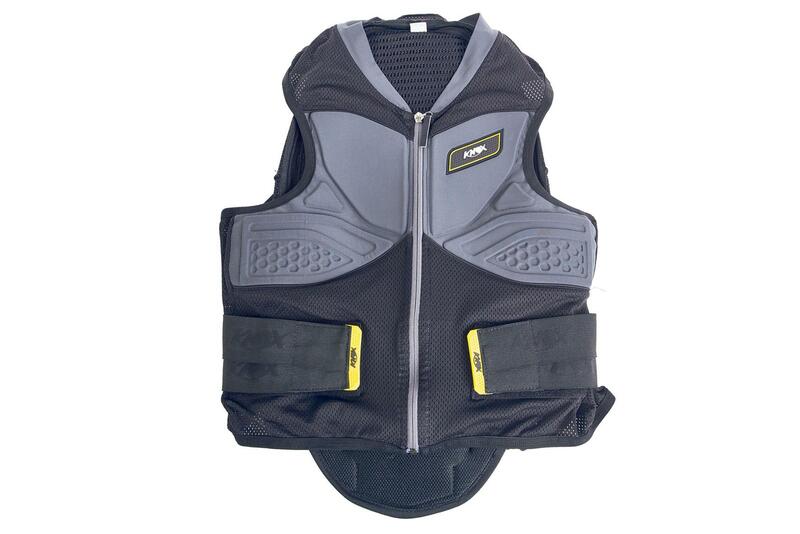 For an extra £19.99 you can add a chest protector." What’s not? "If you’re a cattle-class big unit (like me) then you might find it a bit snug, even in the biggest available size (XXL) – so try before you buy. It lacks a little of that rugged yet technical feel that much of Knox’s range exhibits, while it’s been faultless in operation."